Every year, hundreds of winter tires are tested to see if they can pass the snow traction tests that will earn them the severe service mountain snowflake symbol. It’s an intricate test: engineers need just the right air temperature, just the right type of snow, and special instrumentation for measuring snow traction performance. In the 1990’s, the U.S. Rubber Manufacturers Association and the Tire and Rubber Association of Canada (TRAC) were looking for a way to help drivers identify tires that were designed to perform in severe snow and cold weather conditions. 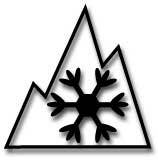 In 1999, they came up with a snow traction test that winter tires must pass in order to receive what we now know as the severe service emblem—the snowflake on the mountain peak. Now drivers searching for winter tires or all-weather tires look for that winter tire symbol. So, what’s really involved in the testing that leads to tires earning that emblem? So, what’s really involved in the testing that leads to tires earning that emblem? To find out, we spoke to one of the engineers at Smithers Rapra, which operates an outdoor winter tire testing facility in Michigan, not far from Sault Ste. Marie, Ontario. The ambient (air) temperature must be less than 3 C. The rubber compound of summer and all-season tires hardens at 7 C. Winter tires contain a special rubber compound that keeps them soft and flexible in extreme cold. The snow temperature must be between –15C and –3C. The snow has to be medium pack snow. Smithers uses natural snow that falls at their site during their December to April testing season. Medium pack snow—neither hard-packed nearing icy, nor too soft and powdery—really puts winter tires to the test for snow traction because the tread can bite into it. If need be, the test team uses their specialized snow preparation tools to move snow around and break it up to create the perfect medium pack snow. Winter tire testing standards are defined by the American Society for Testing and Materials (ASTM). Tire manufacturers can conduct these tests themselves, or hire a private testing company such as Smithers to do it for them. Manufacturers use the results from these tests to determine whether they can brand their tires with the mountain snowflake symbol. ASTM standard F1805 specifies what kind of vehicle can be used to carry out the snow traction tests, and standard E1136 specifies which kind of specially built test tire is used as the control for these tests. The test tires must be stored outdoors in a shaded area so they come to the test area cold, and the test tire goes on the right rear tire. The left rear tire, which is not being tested, has a traction chain on. For example, if a tire has 1,000 pounds of vertical force and it generates an acceleration force of 500 pounds, its force coefficient 0.5. The higher that number is, the better. To meet ASTM winter tire standards, the test tire has to reach 110 percent of the control tire’s coefficient. If the control tire has a coefficient of 0.25 and the test tire has a coefficient of 0.5, then it’s at 200 per cent of the control and exceeds requirements to be designated for severe service. The test is executed: The vehicle drives at a speed of 8 km/hr and the driver applies the brakes to three of the vehicle’s wheels to keep the vehicle speed constant while a control system causes the test wheel to accelerate from 8 km/hour up to 32 km/hour and spin out. This simulates what it might be like getting out of your driveway on a snowy morning. While the tire is spinning out, its forces are measured and then these are compared with those measured for the control tire. The test is repeated over three different days and the tire manufacturer receives the average result. This is why it’s always best to outfit your vehicle with quality winter tires or all-weather tires to ensure you’re going to get the performance you need in winter conditions. When you’re looking for superior safety, be sure to look for winters that bear the severe service mountain snowflake winter tire symbol so you’ll get proper traction at temperatures between 7 C and freezing extremes. fig. The severe service mountain snowflake symbol is an easy way for drivers to identify designated winter tires and all-weather tires. Source of winter tires testing process: Smithers Rapra.